Our Saturday Parties are designed to give you the Ninja Warrior party experience for an affordable rate. We run multiple parties at a time to keep up with the high demand for our parties. Due to the amount of guests in the facility at once, we can only accommodate 10 participants per Saturday party. 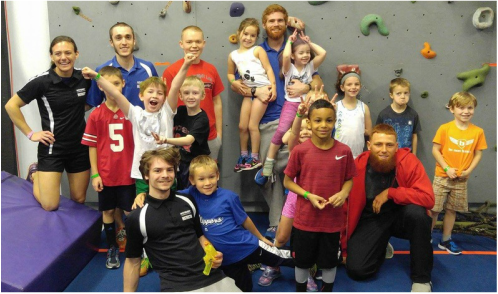 Saturday parties will start with some Open Gym time, followed by our Ninja Warrior Course! Parties are for ages 5 and above. *Party times marked with an * are parties with the VIP party room pricing option. The VIP party room is more spacious with a sink and large counter top space. Perfect for a party with lots of food and presents! Saturday party are designed for only 10 participants! This is to help prevent the gym from getting overcrowded, for everyone's safety, and to help ensure each guest will get plenty of time on the obstacles. To help enforce the limit of 10 participants, there is an increasing scale of charges for each extra individual brought to the party (see table below). Please tell your guests that your party is strictly limited in size! Absolutely no more than 15 participants. If more than 15 participants come, they will not be allowed to stay due to limited space. If you are interested in hosting a larger group, please look at Sunday parties. When you invite your guests, ask them to fill out the online waiver ahead of time so you don’t have to use party time waiting on people filling out their waivers. You can find our waiver on our home page at the bottom left-hand side. Please tell your guests that your party is strictly limited in size. If they bring extra children with them the price will increase dramatically and you run the risk of not having enough room for everyone. Set-up time: With the new schedule, there will be more overlap of the parties. About 45 minutes after your party starts (halfway through your gym time) you will be able to set-up/decorate your party room. Party room: There are two 6 foot tables with about 20 folding chairs. We have a refrigerator and freezer in our employee room that you can ask to use for ice cream, etc. Please label anything placed in the fridge!